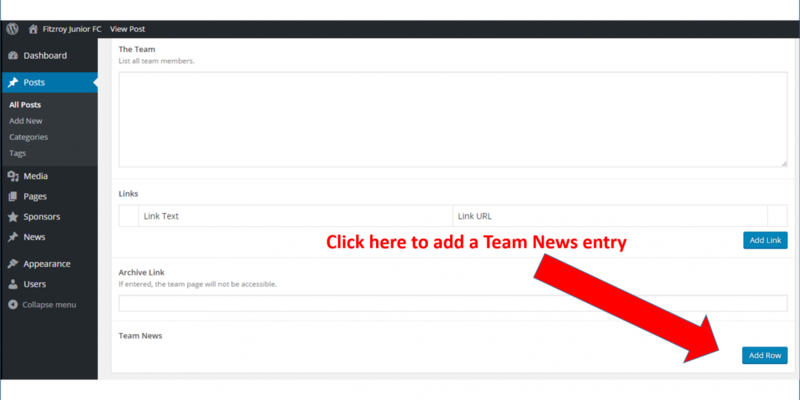 This page provides instructions on how to add a Team News entry. Follow the steps for How to log in to edit the Team Page so that you are on your Team Page ready to apply edits. The Team News entries are managed in a table on the Team Page under the heading “Team News” towards the bottom of the page. To add the first news entry simply click on the “Add Row” button as shown in the image below. However, once the first row has been added (you will see the row number in the far left column of the table) then any additional rows should be added by clicking on the “+” sign in the far top right of the table. This will ensure that the new entry goes to the top of the table and allows entries to be presented on the page in reverse chronological sequence. Note that you may move rows around in the table by simply dragging the row from one position to another in the table. Content – this may be text that can use the standard edit controls for Boldface fonts, Italics, Hyperlinks, Bullet point lists, Text justification etc. See Step 4 below if you wish to include any images in the body of the team news entry. No more than three images should be included in the body of each entry. See instructions for use of the Team Gallery for inclusion of more team photos. You can even create a link to a YouTube clip. Image – each article should attempt to have an image associated with it. Note that for the creation of Team News/Match Reports, there are a set of guidelines that we would recommend that authors follow – please see Guidelines for Team News/Match Reports. After entering the three fields for the Team News entry, it is recommended that you click on the “Update” button in the publishing controls on the right of the page. This will save your changes. 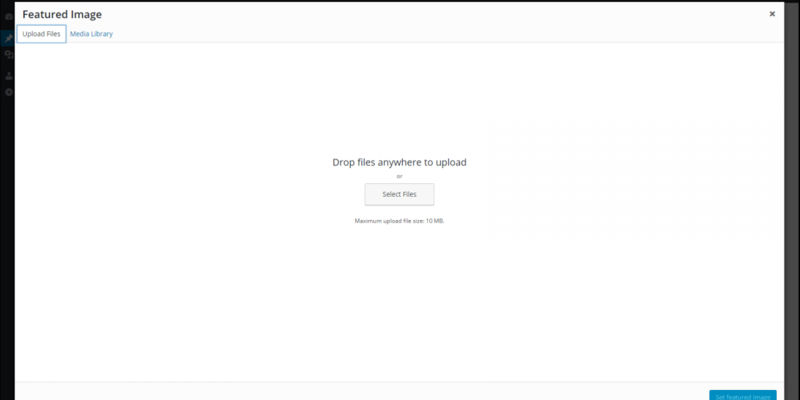 You can then use “Select Files” to select the required image file from your computer. IMPORTANT – See Step 5 prior to loading up your Featured Image. All images you load will become part of the FJFC Media Library – along with all other teams. While you will only be able to view images/files that you load to the Media Library, there is a single library that holds all team images/files. It is important that you load your file to the Media Library with the correct naming standard. Your image files should be JPG, PNG or any other standard image file format. Now you can go to the Team Page Instructions and check out how to do other updates to your Team Page.